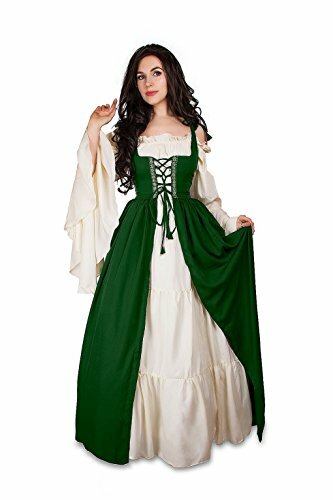 Renaissance Medieval Irish Costume Over Dress & Cream Chemise Set (S/M, Hunter Green) | What Should I Say? THE IRISH OVERDRESS Fitted sleeveless bodice ~ may be worn with any style chemise Front lace-up Shoulder lace-up for better fit Lovely brocade trim (varies due to availability) Soft cotton blend material Laces in back to cinch to custom fit SIZING XXS/XS = 28" to 32" bust and a 24" to 30" waist S/M = 32" to 36" bust and a 30" to 34" waist L/XL = 36" to 42" bust and a 34" to 40" waist 2XL/3XL = 42" to 48" bust and a 40" to 46" waist 4XL/5XL = 48" to 54" bust and a 46" to 50" waist Length for all sizes: 56" (easy to hem if needed) **Color may vary slightly from pictures CHEMISE NOT INCLUDED FABRIC The fabric is a light weight Poly-Cotton blend ( 85% poly, 15% cotton ). Strong and Durable. Will not shrink or loose its vibrant color. Virtually wrinkle-free. FABRIC CARE INSTRUCTIONS: Wash with lukewarm water. Will look new wash after wash. Tumble dry in medium heat ~ won't need ironing if pulled out of the drier when ready. Will not shrink or loose it's vibrant color. If you have any questions about this product by Reminisce, contact us by completing and submitting the form below. If you are looking for a specif part number, please include it with your message.